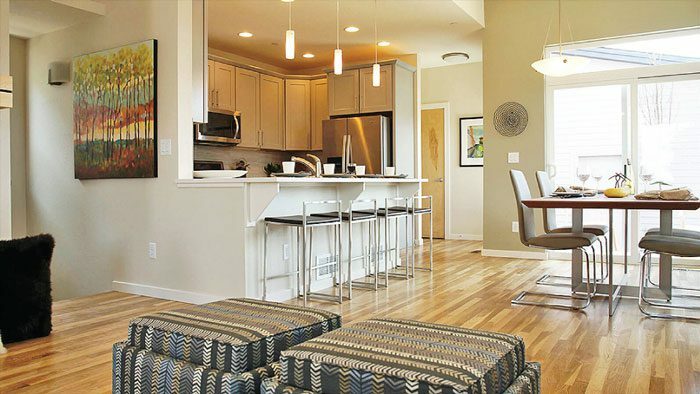 Contemporary easy living condo lofts at North End. LOUISVILLE – Ski weekends. Backpacking trips. A month in Asia. Leaving home for one day or thirty is a lot less stressful if mowing the grass and shoveling the snow are someone else’s responsibility. Homebuilders call it lock ‘n leave convenience. 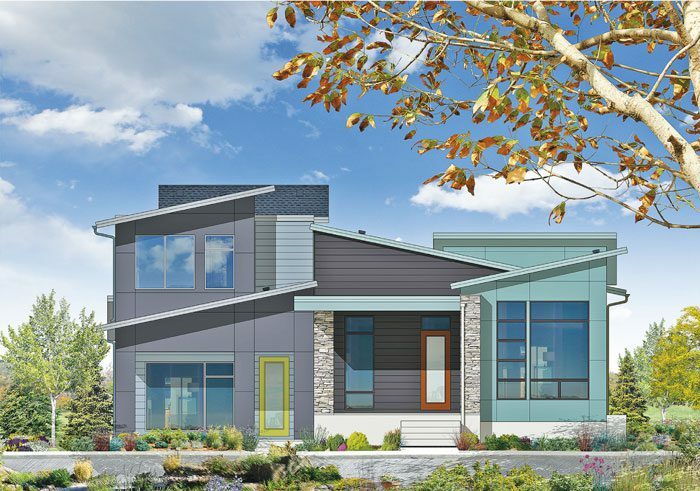 Markel Homes calls it easy living, and they’ve put the concept front and center in the development of several properties at North End, the builder’s new urbanist community east of 95th Street on South Boulder Road in Louisville. Markel Homes is giving buyers a variety of choices at North End that offer come-and-go convenience and low maintenance, including condo lofts, duplexes and singe-family homes. The second 12-plex of contemporary easy living condo lofts is under construction this summer. Each of the 2-bed/2-bath condos occupies a corner location, with large windows in the great room and the master suite. Several units feature stunning Back Range views. Every condo has a patio or deck and a single-car garage. There’s an elevator in the building and front door security. Pricing starts at $389,900. Kitchen and dining area at the Falcon at North End. Located on Hecla Drive in the southwest corner of North End, Block 10 is buzzing with construction. Markel is betting that the blend of easy living single-family homes, duplexes and nearby condo lofts will bring homebuyers of different ages and stages to the properties in Block 10. Living with a lighter footprint is a priority for many buyers, particularly millennials. Busy parents appreciate the low maintenance, access to outdoor recreation and close proximity to Louisville’s family-friendly Main Street. Excellent schools are another drawing card. Empty-nesters gravitate to a home type that allows for travel without worrying about the yard and the snow. Four custom-designed 3-bed/2.5-bath single-family homes are going up now on Hecla Drive, with two more starting soon. The site plan calls for a total of thirteen two-story single-family homes in Block 10, featuring newwest and contemporary architectural styling. Muted natural tones, bold accent colors, large windows, angled roof lines and metal railings create exteriors that exude warmth and character. The open floor plans feature main-floor and upper-level master suites (some vaulted), two-story living areas, main floor studies, lofts, outdoor living areas and unfinished lower levels with roughed-in plumbing. Some of the homes will have views of Hecla Lake Open Space and the peaks of the Back Range. The homes are all green built and Energy Star® certified for a lighter footprint and energy savings. Homeowners receive snow removal and landscaping services through the HOA. 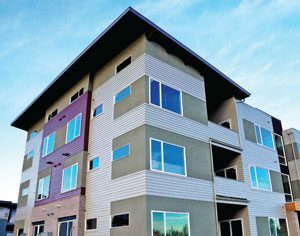 Block 10’s easy living duplexes will feature fabulous exterior colors and huge windows. Distinctive lines and angles give the homes a contemporary sensibility and immediate curb appeal. Featuring ranch-style and two-story designs, the 3-bed/2.5-bath duplexes have main floor and upper level master suites, outdoor living areas and open floor plans. The single-story duplexes with a main floor master suite include a finished lower level with rec room, two more bedrooms and a second full bath. All three bedrooms are located on the upper level in the two-story duplexes, with an optional lower level finish. Markel’s newest North End model, the Falcon, showcases the custom design, quality construction and stylish finishes of the easy living single-family homes and duplexes going up in Block 10. The kitchens are equipped with a gas range, under-mount sink and solid surface countertops. Hardwood flooring, large windows and natural light accentuate the open feel of the main level. The master suites feature a five-piece bath and walk-in closet, and the gas fireplace adds a warm, inviting ambience in the living and dining areas. The Falcon model is located at 1502 White Violet Way, Louisville. Stop by the North End Sales Center to request a tour. Parks, trails and footpaths are part of the landscape at North End. Open space, fresh water and the native wildlife at Hecla Lake bring an expansive, natural feel to the neighborhood. Block 10’s location attracts buyers who want the option to park the car and do their errands on foot or bicycle. The shops and services on 95th Street are within walking distance. Cyclists can easily connect to the area’s vast trail network, or take a shorter ride to Waneka Reservoir and circle back for coffee, ice cream or craft beer in downtown Louisville, a 10-minute walk from home. Sales Center open daily 11 a.m. to 5 p.m.
Visit the North End Sales Center at 1805 Blue Star Lane in Louisville to see the progress at Block 10, tour the Falcon model or inquire about the condo 12-plex as well as other activity in the community. Sales Manager Michel Steward can also be reached by phone (303.604.9196) or e-mail (Michele@MarkelHomes.com). You can visit Markel Homes online at MarkelHomes.com and follow them on Houzz.com and Facebook.